AS HAPPY AS I AM with my Nokia N8, I'm disappointed to discover Qik is not optimised for use on it. This means that I cannot control Qik recordings on the N8 as well as I can on the Nokia N86. I cannot set a description of a clip and Qik's Symbian S60 software seems to ignore A-GPS so there's a lack of precise geolocation when using Qik on the N8. However, the biggest issue is with multi-tasking. If a previously-running process does not give way to Qik, it's possible to freeze up the handset in the middle of a Qik clip. I'm normally careful how I run Qik and I usually terminate all processes before making a live recording. However, sometimes Pixelpipe just fires up and ruins my best-laid plans. I know I cannot shoot an 640x352 resolution recording with the camera upstreaming "best quality" while Pixelpipe is also using bandwidth. When I do that, my N8 crashes every time. I've started a Flickr photoset about and with the N8. I am Topgold on Qik. IN EARLY 2011, Tipperary Institute, in partnership with the Limerick Institute of Technology will run a semester-long Special Award called Digital Promotion for Business . We wrote the short course by pulling together HETAC-accredited modules in Media Writing, Social Media, Public Relations, Web Analytics and Group Project work. The continuous assessments for each of the modules weave together the academic workload to create a group dynamic that will result in participants seeing ways to promote both their own brands and their business interests. Several other accredited programmes exist in Ireland, covering some of the facets inside this Special Purpose Award. However, I've not encountered anything that brings together all the learning objectives so they can be curated as group work. We plan to run the programme in Limerick, starting in January 2011 with a small cohort of students from the Dell Redundant Workers' Association. A COMBINATION OF FACTORS prevented me from releasing my Sunday News from Ireland before noon today and I explain some of those reasons in the first two minutes of my YouTube clip (above). For what it's worth, I normally shoot the news clips by using my Nokia N8 and Qik. Today's Qik clip suffered a major failure because of an overloaded operating system and an overburdened wifi node. I also make a short audio clip and shovel that up to Audioboo because a dozen loyal listeners just want the podcast version of the news. WE HAVE A HISTORY of rehoming Irish animals and little Mia goes out of her way to pet the neighbour's King Charles Spaniel. So when the face of Trixie scroll up on my Irish Animals Alerts for County Tipperary, I had to snap and share her here. 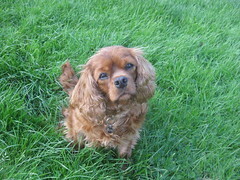 Trixie is a beautiful five-year-old King Charles. Her bio says, "She is a great dog. She is sweet and friendly and affectionate. Trixie is great with kids. She will make a great family pet. She is also house trained. Trxie is looking for a great home where she will get all the love and attention she deserves. She would be a great pet for any family. Trixie has a heart murmur, but she is doing fine on medication for it. This medication will cost 25-30 euro per month. She would love a nice secure garden where she can play. She also loves her walkies." Pauline has details on +353 87 917 2474 and if you ring, you'll discover that the Rescue prefers to rehome their animals in places where the dog will have some company during the day. SIGNIFICANTLY COLD WEATHER blankets Ireland and I've got the gloves to make it through the most bitter conditions. The problem is with my touchscreen phones. I can't get the little devices to respond to simple things like answering a phone call unless I wear touchscreen gloves from Debenhams. I can't get my newest phones--even the ones made by engineers in the arctic conditions near Helsinki--to work while wearing my time-worn leather gloves. They don’t conduct electricity. And my fingers don't work well when frozen. So I'm looking at soft, 100% acrylic gloves with special conductive material woven into the thumb, index and middle fingers, so I can tap, pinch and scroll when white stuff is landing on my screens. I'm posting a photo on my blog because my wife looks at my pages on the run-up to Christmas, hoping to find inexpensive gifts for me. 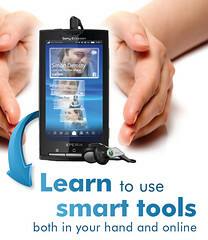 To solve my touchscreen issue, I'd like either a pair of special gloves or another Nokia N8 earbud assembly because I'm able to use the earbuds to answer phone calls and toggle through audio playlists. Amazon has nice pink-festooned touchscreen gloves. I like Freehands Gloves costing $20 a pair. Firebox Gloves cost $26 a pair. 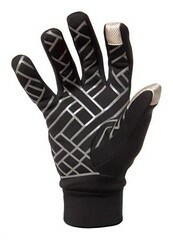 Tavo Gloves cost $29 a pair. BOTH NORTH AMERICAN Thanksgiving celebrations give me pause and I wish I respected Thanksgiving Day more by officially booking a day off from work in Ireland. Instead, I spent it snarling and that's not good for anyone. I did a quick search of my blog for the words "thanks" and "cheers" and realise I haven't used them much at all in nearly a decade of blogging. 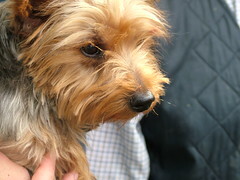 But over on Flickr, I've got shots of thankful things--like the little Yorkie who probably felt thankful that he was adopted by one of Tipperary Institute's students after a field trip to the Inistioge Animal Rescue. We're fortunate to have a home that's warm and neighbours who graciously loaned us mains power while we were setting it up in the months before moving in. That was five years ago when we weren't connected to the Electricity Supply Board. We moved in before Ireland was tweeting and today, several of our neighbours connect virtually to our memories through Facebook. That gives me a warm feeling but not as strong as using wifi in our home to let Mia the toddler talk to extended family with Facetime. Having a walk-around video calling system is something our three-year-old has always known. Some day, I think she will be thankful for that comfortable technology too. My Flickr photostream of thanks. HERE IN IRELAND remnants of past civilisations stand defiantly along the roadside or lie directly underfoot on trails connecting small towns. We need to start telling stories about these historical things and offer them directly into the earbuds and playlists of people who appreciate stories of rich cultures. At Tipperary Institute, we're looking at ways of leading tourists along isochronal lines (i.e., showing visitors remnants from the same decade) because it's fascinating to rewind time while walking the land. Ireland is blessed with these lovely stories such as the ones we recorded with Labhaoise McKenna from the South Tipperary Heritage Office and next semester we will unveil dozens more on iTunes and YouTube. Sent from my Nokia N8 phone along the walls of Fethard after watching it on YouTube. WHILE VISITING FRIENDS in the States, I thought a lot about friends who have racked up thousands of flying hours like myself. 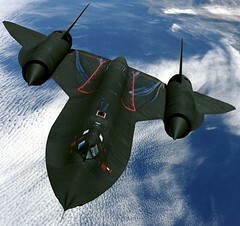 During hundreds of those hours, I would find myself next to special aircraft like the SR-71 Blackbird. One several airlift missions, we would carry a roll of film from the Blackbird back to a specialised imaging laboratory. Ours was like a high altitude courier mission. The Blackbird guys had the most fun. One of my college friends was an SR-71 pilot and years ago he told me about the little procedure they would use when setting out to complete a local training mission. In his case, he made a request for an altitude change and the results were similar to the story recalled by Brian Schul below. THERE IS A MESSAGE of inspiration and hope in and around Pixar Animation Studios and you'd expect this kind of short video as a result of that dynamic. I'm glad it dropped into my YouTube flow because it increases my awareness of the awesome diversity we will have on the campus of LIT-Clonmel next year when we start working with our first cohort of animation students. It's a big leap from third level to the cutting room of Pixar but along the way, there's a respect for diversity that rings true. It Gets Better. Love, Pixar. And from the credits: If you are considering thinking about suicide, please contact The Trevor Project. THERE IS NO NEED to check the newsfeeds from Ireland for an accurate reading of the State's financial health because the government's pronouncements obscure reality. It is now predictable behaviour and very similar to Comical Ali facing the cameras with American tanks rumbling freely in Iraq. My advice for balance on the Irish question is to read the Wall Street Journal or Financial Times. I strongly recommend that tactic, especially if you want incisive analysis without having to listen to the spin of the current Irish government. Sent mail2blog using Nokia N8 O2-Ireland Typepad service in County Tipperary, Ireland after reading Storyful's lead item and @GTCost on Twitter.